Selena Lasota looks for an opening. The junior attacker was held scoreless in NU’s previous game. With around 10 minutes left in a matchup against No. 1 Stony Brook last Saturday, it looked like Northwestern might pull off the upset. The Wildcats had a chance to cut the top team in the country’s lead to one, and had scored three straight goals while winning four consecutive draws. And then came a stick violation and a called-off goal. Stony Brook stole the momentum and launched a 5-2 run to end the game, and NU fell in a 15-10 loss. A week later, the No. 12 Cats (4-2) prepare to play their third of six straight home games. When Marquette (4-3) comes to Evanston on Saturday, the focus for NU will be on how to fix small errors and convert on key chances. Despite Marquette’s lack of a national ranking, Saturday’s matchup does pose some challenges for the Cats. The Golden Eagles average 17.29 draw controls per game, the fourth-best in the country, compared to NU’s 13.67 per game. 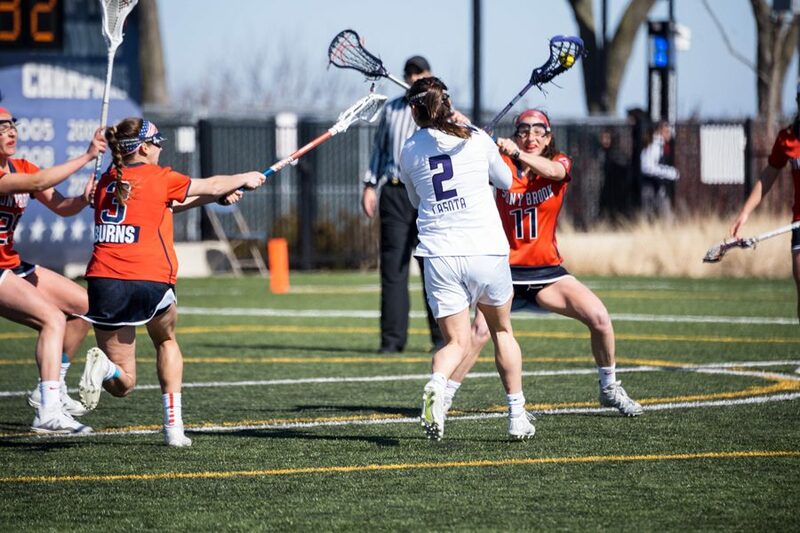 Senior attacker Shelby Fredericks has been the key for NU in the circle. The Cats’ draw specialist sat out the first four games of the year with an injury, but she has been strong in her return, winning 19 draw controls in the past two games. In the loss to Stony Brook, the Cats managed to win 18 of the game’s 27 draws, and all but one of their goals came on possessions in which they won the draw. Yet NU failed to win the final three draws of the game, and the Seawolves scored on two of those three final possessions. Fredericks said taking advantage off the draw will be a priority moving forward. Fredericks said the Cats also needed to find their way to the free-position line. NU scored on just two of its 11 free-position shots against Stony Brook, and leading scorer Selena Lasota, who was held scoreless that day, went 0-for-3 on free-position shots. NU ranks last among Big Ten teams and 93rd among all 115 NCAA teams in free-position percentage, converting just 34.1 percent of its free-position shots. Nesselbush scored one of her three goals from a free position and mentioned the importance of focusing when given those chances. A tough road lies ahead for the Cats after Marquette. Two of the three opponents remaining in the six-game home stretch — No. 6 North Carolina on March 17 and No. 8 Syracuse on March 23 — are currently ranked in the top 10. The Cats suffered losses to both the Tar Heels and the Orange in the previous two seasons.